There will be a new addition to the family of statues in front of the Staples Center. 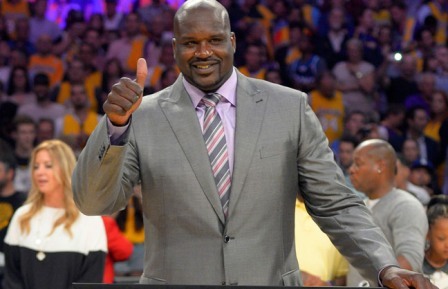 On March 24, a statue of Laker great and sports analyst Shaquille O’Neal will be unveiled. AEG organizations and STAPLES Center agreed to build the statue. The 1,200-pound bronze statue will be suspended 10 ft above ground, connected to the Staples Center. The unveiling ceremony is free and open to the public at 5:00pm on March 24 at Chick Hearn Court. O’Neal is expected to speak along with other teammates and friends at the ceremony. O’Neal spent eight seasons with the Los Angeles Lakers, leading the team in scoring for six straight season. His superior contributions assisted the franchise to three championships from 2000-2002 and earned him Finals MVP honors each time. During the 1999-2000 season, Shaq averaged 29.7 points per game, making a season high of 61 points. O’Neal still holds the Lakers record for most offensive rebounds in a game with 14 from his performance against the Memphis Grizzlies in April 2003. During his stint with the Lakers, Shaq was also elected Western Conference Player of the Week seven times and Player of the Month once. The comedic center has the most NBA Player of the Month titles out of any Lakers player with seven. In 2000, O’Neal became NBA MVP. In 2011, O’Neal retired from the NBA and later became a basketball analyst for NBA on TNT, creating the “Shaqtin’ A Fool” segment. O’Neal was inducted into the NBA Hall of Fame in 2016. Sculptors Julie Rotblatt-Amrany and Omri Amrany created the statue of O’Neal. The duo also created statues of iconic Lakers figures like Kareem Abdul-Jabbar, Earvin ”Magic” Johnson, and late play-by-play announcer Chick Hearn. Rotblatt-Amrany and Amrany also created statues of L.A. Kings great Wayne Gretzky and iconic boxer Oscar De La Hoya, which all stand outside the Staples Center.